Imperial Tradition is a caviar extracted from the White Sturgeon, a native species of the Pacific Ocean found in the North American West coast. It is one of the longest-living sturgeons, reaching up to one hundred years of age. It weighs 1760 lbs (800 kg) and can be as long as 19ft (6 m). High in protein, this lean fish is particularly refined and so is its exquisite large roe ranging from 3.0 to 3.2 mm in diameter and varying between dark grey to black in color. The Lac St-Pierre caviar originates from the Lake sturgeon also known as the Yellow sturgeon. It is still harvested from the wild following extremely strict environmental guidelines and quotas. Lac St-Pierre caviar is an exclusive product to the province of Quebec in Canada. The pearls in the ROYAL selection are perfectly black and are medium sized (about 2.4 – 2,8 millimeters). It pairs nicely with potatoes, sour cream, crème fraiche, soft bread or with blinis. Oscietra caviar comes from the Russian Sturgeon (native to the Black Sea, the Caspian Sea and the Azov Sea). It is a medium size fish that can weight from 44 to 110 lbs (50 Kg), providing a poppy and slightly nutty caviar with colouring that ranges from dark brown to beige. Many consider this to be the most refined caviar. Its eggs are large sized (between 2.7 and 3.2 mm). On average it takes 9 and 13 years before getting this precious type of caviar. Da Vinci caviar comes from the Adriatic Sturgeon, an Italian species from the Adriatic Sea and the primary waterways of the Padano-Veneta region, Dalmazia, Albania and western Greece. This caviar, with its fresh, intense and decisive taste, has a particularly smooth consistency and its eggs are characterized by medium sizes (about 2.4 – 2,8 millimeters) more often in shades of brown and black. It takes 10 to 14 years to get the best caviar of this species. The Lac St-Pierre caviar originates from the Lake sturgeon also known as the Yellow sturgeon. It is still harvested from the wild following extremely strict environmental guidelines and quotas. 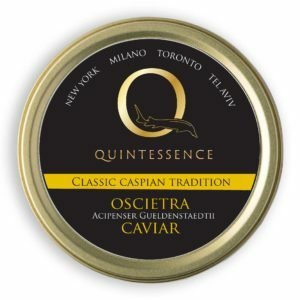 Lac St-Pierre caviar is an exclusive product to the province of Quebec in Canada. The pearls vary in color from dark green to black and are medium sized (about 2.4 – 2,8 millimeters). It pairs nicely with potatoes, sour cream, crème fraiche, soft bread or with blinis. Sevruga caviar comes from the Starry Sturgeon, a species which rarely reaches 55 lbs (25 Kg). It can be found in the Black Sea, the Caspian Sea, the Azov Sea and in its tributaries, and it is also in the Aegean Sea and eastern Ionian Sea. It has an aromatic taste and is characterized by small eggs (about 2,2 – 2,6 mm) with a color that varies from light to grey. It is an extremely delicate fish to breed and it takes from 8 to 12 years of waiting to get the caviar. Quintessence created a selection of Russian Tradition caviar for the growing Russian communities worldwide. Traditionally Russians eat caviar as is with a spoon but also smeared on a rye bread toast with butter and avocado. This special selection is made with Oscietra and White Sturgeon caviar, but never mixed together. We select a soft caviar perfect for toppings and great for spreading. The Russian Tradition caviar is only available to wholesale accounts.